It’s Father Dave, and I’m excited to be back with you again. Firstly, thank you to everyone who tuned in to the video-cast of our Sunday morning worship service here at Holy Trinity. And a special thank you to everyone who sent feedback, all of which was helpful. As many of you realise, we hit technical problems about 15 minutes into the broadcast. Fighting Father Jim, who has now taken on a new role as ‘senior video technician’, tells me that for some unknown reason the videocast suddenly switched streams and started broadcasting on the test stream. I don’t have a clue what this means, but Jim is on to it! The video quality was excellent (for as long as it lasted), and a lot of you guys were really impressed with the architecture of our church building. It is a beautiful building. It’s easy to forget that and take it for granted after 22 years in the place. The sound quality was not brilliant. Fighting Father Rod from the UK said that “The sound system picked up everything – even the mouse running up the organ pipes”. Thank you. I’ve installed a mouse trap! Mind you, Rod added that “it took the Albert Hall a while to get it right!” I take that as an encouragement. Fighting Father Tom from Nevada, USA, offered the most encouraging response to the sound. He wrote, “when Ange and the ladies started singing, our cat Roda started singing with them. She has never done that before. I guess the ladies moved her.” What can I say? This opens up a whole new range of ministry possibilities! Anyway, we hope to have the technical problems sorted by the end of the week and we’ll try to integrate the sound feed into our main sound system. Hopefully the result will still be cat-friendly. Either way, we’ll try again this coming Sunday – same time, same place. In terms of the ‘place’, we are streaming through church.tv, and you need to take out a free membership there if you want to tune in (and a big thank you to Mark of church.tv who invited us to be a part of their program and is charging us nothing for the privilege)! In terms of ‘time’, be warned that Daylight Savings kicks in on Sunday in this part of the world, which means that we lose an hour. If you’re in doubt as to what 9.15am Sydney-time looks like in your part of the world, try this oneline timezone converter. Forgive me if this sounds like boasting, but I was really chuffed to find an article about myself and our Fight Club in Sydney’s Sun-Herald newspaper yesterday. The online version of the story is here and it includes a video interview. The video was done ringside. I don’t look particularly well-groomed . Even so, I am deeply grateful to Dave Sygall, who put the story together, and to his partner, Blaise, who jumped in the ring and did a few rounds with me last Thursday night (and showed real pugilistic promise)! Mother Agnes Mariam of Homs comes to Holy Trinity! Some months ago I was chatting with Fighting Father Alan Longergan (one of our Irish Fighting Fathers) about how neither of us believed what we were being told about Syria. Alan though actually did something about it. Being a Catholic himself, he called the Catholic Diocese of Homs in Syria and asked them who he could talk to in order to get a frank update from a local! The church in Homs put Alan on to Mother Agnes Mariam – a Melkite Nun who was Mother Superior of the of the Monastery of St. James the Mutilated in Homs. Next thing you know, Alan has Mother Agnes appearing on national talk-back radio in Ireland. You may have heard the interview. I posted a copy to the member site back in June (click here). 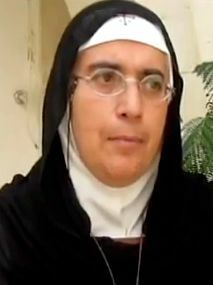 TV interviews followed, and Mother Agnes started to get worldwide attention as she was challenging the accepted Western narrative about what was going on in Syria – a narrative that depicts the Syrian rebel armies as the modern equivalent of Robin Hood and his Merry Men, with Bashar Al Assad as the evil Sheriff. It wasn’t long, of course, before a public defamation campaign was launched against Mother Agnes. Soon her life was in danger! Evidently she upset some powerful people. Mother Agnes was forced to leave Homs and escaped to Lebanon – the country of her birth. From there she has continued to promote the “Mussalaha” (or ‘reconciliation’) initiative, believing that Syria’s problems can be solved without further armed conflict, and without any military intervention from abroad! Mother Agnes is now travelling the globe to tell people everywhere about The Mussalaha Initiative, and she is taking our Irish brother, Alan, with her every step of the way! Both of them will be arriving in Sydney next Sunday morning, and we will be hosting the two of them at Holy Trinity on Sunday afternoon. When: Sunday October 7th, starting with an afternoon tea at 3.30pm in the church hall. Where: Holy Trinity Dulwich Hill, corner of Herbert and Seaview Streets in Dulwich Hill. I suspect that our Islamic friends from the Imam Husain Centre may well supply much of the afternoon tea, as they are always generous in their catering support for these events, and I know that there are quite a few Syrians there who will be keen to meet Mother Agnes. Anybody though is welcome to bring a plate. We’ll move into the church building to listen to Mother Agnes at some time between 4 and 4.30pm. If you don’t know how to find us, there’s a map on holytrinity.org.au. If you can’t make it to the Sunday afternoon meeting, there is a dinner on the Monday night, which will also be in Dulwich Hill (at Tony’s Family Restaurant, which is just around the corner). That meal will cost you $70/head, which is all inclusive. Let me know if you’d like me to book you in for that one. And if you can’t make it to either event on account of the fact that you are currently in Saskatchewan and I just haven’t given you enough notice, don’t panic! I’ll try to do a video-cast of the event, or at least do a video recording. You’ll get to meet Mother Agnes virtually if you can’t meet her in person. Even so, if you can make it in person, please do! I am anticipating that this will be a wonderful gathering of people from different nationalities and faiths and various characters from across our community who share a common concern for the people of Syria. I am trusting too that we won’t have any trouble from those who would like to silence Mother Agnes but I plan to invite some of my friends from the local constabulary along just in case. OK, I need to wind up this missive and get to bed as it’s gone 3am here. I’ll be putting out press releases and getting a promotional poster together for the Sunday event and I’ll email that out to you later in the week. Until then, may the Lord bless and strengthen you for the work to which you have been called. P.S. For those who like to encourage me in my running, yes, I did complete my half-marathon run earlier this evening in 1.56.55. P.P.S. 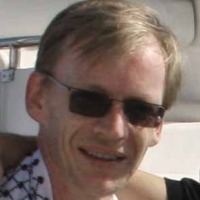 Please continue to post to the forum. Cibby and Jim and I are having a gutsy debate over what constitutes ‘free speech’, and I’d love to get your input.